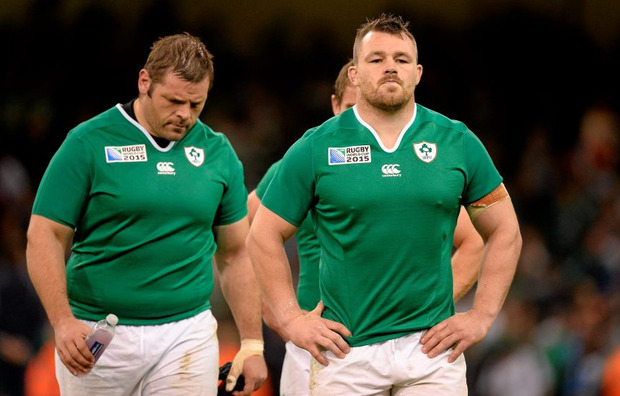 Ireland's Cian Healy, right, and Mike Ross after the game. While all four World Cup semi-finalists hail from the southern hemisphere, the New Zealand Herald believes the situation is not as extreme as it appears. Argentina’s comprehensive victory over Ireland was followed by Australia’s late Houdini act against Scotland, with Bernard Foley’s kick in the last minute enough to see them over the line against a gallant Scottish effort. With New Zealand putting 60 points on France yesterday and South Africa sealing their place in the last four after edging past injury-hit Wales, it was a weekend to forget for the Six Nations sides. The All Blacks in particular looked sensational in defeating the hapless French, but the New Zealand Herald is refusing to get carried away. While postmortems have already begun into the quality of the game in the northern hemisphere, Gregory Paul says it may not bleak as it appears given the results. “The situation is not as extreme as it looks,” he writes. “The Northern Hemisphere hasn't had a great tournament but it's not lagging miles behind. Nor is it a blanket - of simply saying one brand of rugby is better than the other. Gregory discusses one poor defensive read which cost Wales dearly and Scotland’s lack of sufficient defensive linespeed. Assessing Ireland’s departure from the tournament, he suggests fitness levels in the front row are not what they could be, though Cian Healy is only just returning from a long-term lay-off and Rory Best was outstanding throughout, accurate with his darts and making a couple of crucial turnovers..
“The Irish front row in particular were carrying spare tyres, as were the English. This is a sport all about making marginal gains and if the tight five can not only last a bit longer, but get around that bit better, it makes a huge difference. Ultimately, he pinpoints the failure to reach the last four as a result of a conservative game-plan. “Ireland were also hit hard by injuries but their biggest issue is that they don't take enough risks.